I’m finally back home – I’ve been here for two days and what they say is so true, there’s no place like home. All is good, my mom had a trip scheduled and I didn’t want to interrupt her plans so she has left on another adventure. I guess you can say I’m on another adventure too! Hopefully in a week I’ll be able to stand on two feet :-) Today is Day of Giving Friday – an opportunity for me to pass on one of my cards to one of my lovely readers – I realized that Day of Giving Friday has been going for a year and I’m tickled to keep it going. 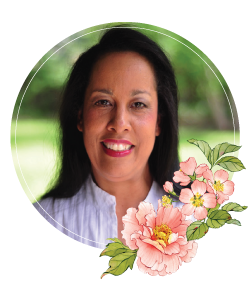 Leave a comment on this post if you’d like an opportunity to receive a card and I’ll send it anywhere world. I have cards that are waiting to be sent and will be on the way on August 26 if the doctor says I can walk and drive. So, to take a little walk down memory lane. I have bins of cards stored up. Over 9 years of making samples, sending out cards and giving loads of cards away, there are still so many left over. I don’t know what makes me pick a particular card for a particular person or even why I select the ones I do for Day of Giving Friday, but when I picked this one today, I knew why. Faith is a beautiful thing and I don’t think you can deny faith, it keeps popping up over and over again like an inviting door. One of my favorite sayings since I was in my 20’s is that ‘one often finds his destiny in the road he takes to avoid it’. I’m gently reminded today, that Faith is taking the first step even when you can’t see the path. Yes, I am gently reminded today…..
My earnest hope is that you trust your faith and step out with bravery and strength; and that by doing so, you are blessed. For new readers, every Friday it’s my pleasure to give away a card. The card goes to a randomly picked reader (worldwide) who leaves a comment in our conversation. One comment is randomly picked and the winners name is posted HERE. If you win, simply send me your address through my comment form and I’ll send the card to you. Want to know more about Day of Giving, here’s a link to my FAQ’s just check out #11. For your comment, what wisdom do you have about taking an unseen path? The only wisdom I have is to blindly trust in God’s wisdom. He is always working on my behalf, planning out all my unseen paths. All I have to do is listen and follow His instructions. I truly enjoy your card today, happy for your improvement of your health. Congratulations that year soon went by ,i hope you will be able to walk and drive soon Becca. Another beautiful card loving the style and colour. Prayer and Faith in my God he leads me every step of the way. Such an awesome and gorgeous card here from you again Becca. I love the colorscheme you´ve used for it, and also the sentiment. I´ve always believed in, that there´s a lot more between earth and heaven, than anyone can possibly explain,and it takes a lot of faith to just walk the way I believe is the right one. I sent you a private mail a while ago Becca, but guess you haven´t seen it, with all that´s been going on in your life here lately. I really hope, that everything will soon go back to normal days for you and you´ll get your good health back to normal again, so you can move around as you´re used to. If I feel it is the right thing to do, no uneasy questions, I will follow a new path. I feel that God is by my side and will help me through. If He doesn’t want me to follow a particular path, He, through my gut instinct will let me know. Beautiful card & sentiment Becca. Such a gorgeous card Becca! As always, your bow is spectacular!! So glad you are healing. A few years ago, I made the decision to move from California to Indiana and be closer to my sons. My 90-year-old mother lived with me, so she moved along with me. We had both lived all our lives in CA, almost all our family was still there and in my golden years, I put my faith in God that he would guide us in this move. BTW, we have 7 generations of our family born in CA, so it was not an easy decision. I’m happy you are back home, Becca. May the Lord bless you and fulfill all your needs as you undergo repairs. The card today is just gorgeous. I can’t stop looking at it! I don’t know how you used the dies you listed in supplies to make this card, but you are a paper magician and everything you touch is brilliant. Mom’s are just the best. I use one of my mom’s beliefs, it is easy to have faith when things are going well, not so easy when they are not. Just keep the faith and we will be o.k.I find me telling my kids the same thing.Thank-you again for sharing your lovely cards with all your readers. I love the saying on this card. & we also had a ministry for the people of or church. like drugging through mud. Then we know it was time. Now we wait in faith for what our next step is. Hope your Mum’s next adventure proves to be a good one! Another beautiful card and sentiment, Becca. Someone is going to be very thrilled to receive it. Faith and trust, underpinned by prayer is the only way in my book! Well, let me tell you where the unseen path has taken me. I came out to AR in February when I was 17 to help with driving for a family member. I met a young man, we got engaged in 3 days. I went home to CA. He came out in June after I graduated, we got married. Last month we have been married 40 years! Praise the Lord! I know it was the Lord that brought me to this place. There is no telling where I would be if I was still in CA. The only wisdom I have I have received from the LORD. Just ask Him for it, He will give it to you! Glad you are on the road to recovery. I don’t know what I would do without my faith in God – and his mercy and faithfulness to me. He doesn’t promise us the path will be easy, but that He will be on it with us and never leave us, and at the end of our journey we will both understand and know why we took the path we did. Beautiful card Becca, and I love the sentiment!!!! It is so true, we never know where a path may lead us or what blessings are in store for us. I definitely would not have chosen the path I am currently on…my husband is on Hospice (since January), but even though we know he has a terminal disease, this path has brought us closer together and has been a time of enjoying each day the Lord gives us….so, I can honestly say it is a blessing. So glad to hear you are on the mend and are home safe and sound! Your eye for elegance never ceases to amaze me. I really love this card. I was going to rattle off all the things I love about it but, actually, I love everything! Your invitation to comment never fails to get me thinking deeply. Truth is, we’re all walking an unseen path, even though we may think we have it all mapped out. In reading others comments, this is a community of like-minded thinkers. The wisdom of walking this path is our trust in God-the Lord truly is our shepherd. It’s such a blessing to be on this path with you. Gorgeous card Becca. Excellent idea, giving away cards to spread the word. I pray you are on your feet soon. What a gorgeous card. It is a shame that the stamp you used is discontinued as it is really beautiful. Works so wonderfully with all of these dies. I love to experiment, so the unseen path is always on my radar. My words of wisdom: If you don’t try, you will never know, right????? Of course common sense has to play a part in these types of decisions as well. Becca, so glad your foot is doing much better, hope your next appointment will be nothing but good news. Sounds like your insurance company is taking care of all of your problems swiftly. That too is great news. Hi Sweet Lady, glad to hear you are back home. I pray for your healing and a full recovery. Interesting . . . Your random day of giving card selections often contain a sentiment or phrase that is the right message at the right time. Today is a perfect example. I love this message today. My advice: Remember – God’s got you! Let go and let God. I need this reminder often. 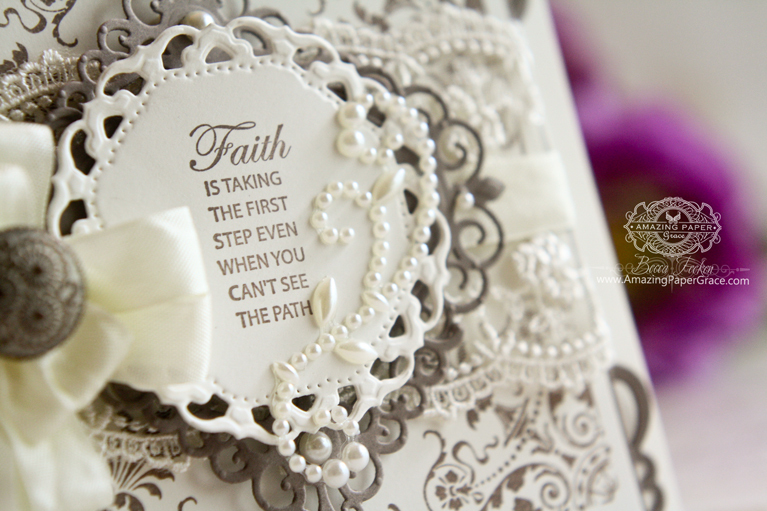 What a beautiful card – love the sentiment too. My advice, to trust God, after all He made the world, and I am sure He still holds it in his hands! I think this is a card I need to hang on the wall where I would see it every day! Such a stunning card today and a lovely verse to go with it. I hope all is well with you and that your foot is healing well. Hello Becca nice to hear you are on the mend ! verse is very encouraging I am going to learn it and we all need to head it !!! 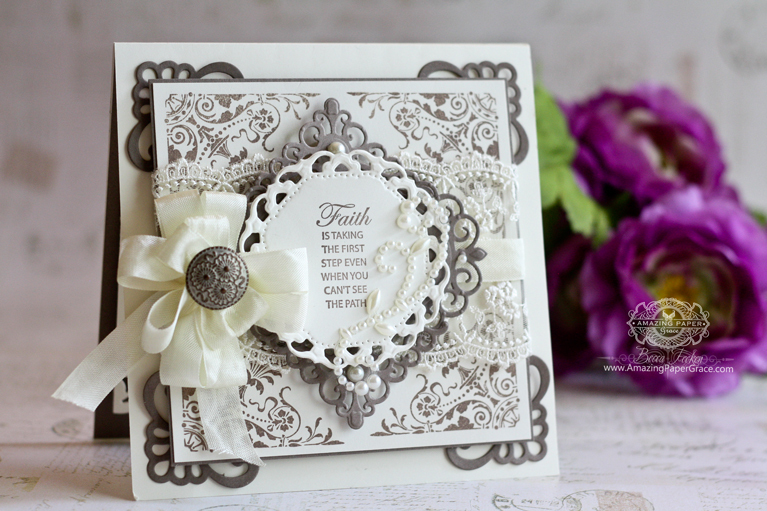 Gorgeous card, so beautiful with all the layers and the lovely color combo! Hi Becca, So glad to hear that you are back home, it will be even better when you are able to stand on ‘two feet’. Your card is stunning, and the sentiment is so ‘meaningful’. I always love your cards Dear Becca. This color combo of white and dark gray is serene and yes, b e a u t i f u l, as usual. Beautiful, beautiful card and it’s good to be reminded that faith is what wins the victory every time. The wisdom I have gained is that God is always with me when I am moving toward something new and unexplored. Your card is gorgeous and who wouldn’t like to win it. I just lost my husband of 48 years and I thank God for letting me have all those years but boy do I miss him. In all the lovely cards you create. ..it always represents “Peace”,”Passion””Love” & “Life”.